Notre Dame's football program will be the money winner in Monday's college championship game. Notre Dame is playing Alabama for college football's national championship on Monday night. But the Fighting Irish are already a certain winner over the Crimson Tide -- at least when it comes to money. Figures filed by collegiate athletic departments show that Notre Dame and the University of Alabama were both among the most profitable football programs in the nation during last year's school year, when Alabama knocked off rival LSU to win the championship. Alabama's football revenue outpaced its expenses by $45 million, good enough to make it the fifth most profitable football program. 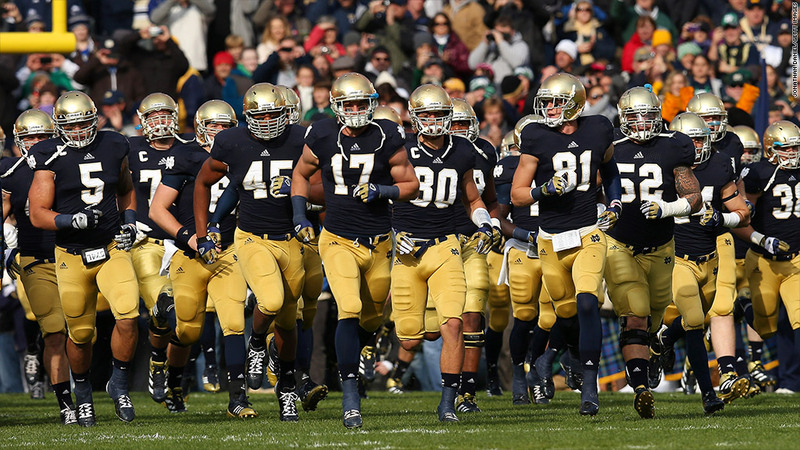 Notre Dame's $43.2 million profit put it at No. 8, just behind LSU and Auburn University, which won the national title two years ago. But while Alabama has to split $23.6 million with LSU, Auburn and 11 other schools in the SEC conference as a reward for making it to Monday's championship, Notre Dame will get a $6.2 million appearance fee all to itself since its football program is not part of a larger conference. That should boost Notre Dame's profits in the coming season and help catapult it past those three SEC powerhouses. Still, none of these schools will approach the University of Texas, which pocketed $77.9 million in profits last season and will certainly hold the No. 1 position again this year despite being stuck in the lower dollar Alamo Bowl. The University of Michigan was the second most profitable program, earnings $61.6 million. It was followed by yet two more SEC powerhouses: the University of Georgia and University of Florida. Both reported just over $51 million in profits. All told, the 121 big dollar football schools that report results generated $2.95 billion in revenue last year, and pocketed a combined profit of $1.2 billion. That's a profit margin that would make any pro sports team (and most public companies) envious. And those numbers are only going to go higher next year when college football finally gets a playoff system.